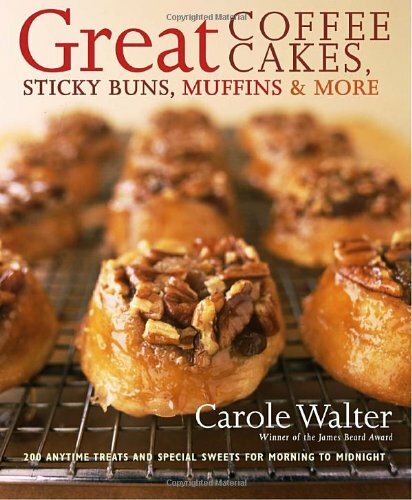 With twenty years of experience teaching baking classes and three award-winning cookbooks to her name, Carole Walter is renowned for her meticulous directions, foolproof recipes, and scrumptious results. In Great Coffee Cakes, Sticky Buns, Muffins & More, Carole turns her attention to the types of treats that are perfect for breakfast, an afternoon snack, or dessert—the sweets people most like to make at home to enjoy with family and friends. From pound cakes, coffee cakes, muffins, and other quick breads to scones, sweet biscuits, Bundt cakes, and buckles, Great Coffee Cakes, Sticky Buns, Muffins & More features more than two hundred recipes for America’s favorite baked goodies. Carole guides novices and expert bakers alike through irresistible recipes including Butter Crumb Coffee Cake, Country Cherry Honey Scones, and Raspberry Buttermilk Muffins with Streusel Topping. A bevy of old-world classics such as Almond Croissants, Double Chocolate Walnut Babka, and Cinnamon Raisin Rugelach are complemented by what are sure to become new favorites, like Crystallized Ginger Pound Cake, Glazed Orange Ricotta Cookies, and Pumpkin Pecan Loaf. Ever since I was a little girl, not much more than three years old, the sweet smells that came from the oven fascinated me and today I am no different. Rather than spend time playing with friends, I perched myself on the kitchen table to watch my grandmother mix up a batch of batter and place it in the oven. When she would take it out I was amazed at the delicious looking treat that she set before my eyes. When I was nine I branched out on my own. I dumped some ingredients into a mixing bowl in an attempt to bake my first cake; it was chocolate of course. To my amazement it came out! I phoned my grandmother and happily told her that next Friday night for our traditional Sabbath dinner, I was going to bring dessert. The following Friday morning I dumped my ingredients again in to a bowl, and to my chagrin, I had one whopping failure! Teary eyed I came to grandma’s house empty handed and from that day forward, I had the greatest respect for a recipe. Recipes used for cooking are purely guidelines for you to arrive at the finished product. A little more of this or that often does not alter a dish. In fact, sometimes you can create something even better. In baking and making desserts it’s a different matter. Ever since the lesson I learned with baking my first chocolate cake, my philosophy has been to start with a recipe, measure my ingredients accurately, and carefully follow the instructions. Because of my un-ending curiosity as to why ingredients work together, today I focus not only on following the recipe, but also exploring the techniques used within the recipe. As a result, I constantly ask myself “is there a better way to do this?” To guide you toward better baking, my discoveries are shared with you. As a teacher, I believe that once you understand the techniques, you will have more confidence to broaden your horizons and make wonderful creations of your own.